Who doesn’t love a bit of cinnamon in their life?! The aromatic spice is full of incredible benefits for health, wellbeing and is so versatile. Cinnamon is a spice created from the inner bark of the Cinnamomum tree. Strips of the inner bark are dried until they curl into rolls known as cinnamon sticks or quills. These can then be ground into powder or made into an extract. What a lot of people don’t know is that there are different types of cinnamon. This article will briefly explain the two main types, Ceylon cinnamon which originates from Sri Lanka, and Cassia cinnamon, which originates from Southern China. The unique properties of this spice come from its essential oils and compounds, particularly cinnamaldehyde. This compound gives cinnamon its flavour and aroma, and is also responsible for many of its health benefits. When it comes to colour, Ceylon Cinnamon is tan brown whereas Cassia Cinnamon takes some reddish dark brown. Cassia cinnamon is the more common of the two cinnamons, this variety tastes stronger and hotter than Ceylon cinnamon, which has lighter and brighter citrus tones. Cassia is most commonly consumed around the world and is the cinnamon that is more often found in supermarkets as it’s a lot cheaper than Ceylon cinnamon and considered to be of lower quality. Another note to be aware of is that Cassia cinnamon is found to be a very rich source of coumarin. This compound is found naturally in several plant species and can be harmful to our kidneys, lungs and liver. This is of course in large doses and doesn’t mean to cut cinnamon from your diet but instead try to source Ceylon cinnamon as this variety has very little amounts of the compound. You can get your daily dose of quality organic cinnamon here, as well as many other organic spices. Adaptogens, you may have heard the word being used a lot recently and for good reason. So what are they exactly? Well these ancient plants and herbs are powerful tools in keeping our bodies in balance. They do as their name suggests and adapt to what our body needs. Their adaptogenic properties help our bodies to adapt to the biological and psychological stresses of everyday life. The unique plants and herbs support our adrenal system and help to balance hormones so we are able to better manage our response to stress on a day to day basis. Years ago when I was having trouble balancing my hormones I introduced adaptogens into my diet and found an incredible improvement in not only my hormones but also my overall health and well-being. For this reason I created our Breakfast Blend. Not only is this blend filled with incredible spices full of health benefits, but it also has two powerful adaptogens, Ashwagandha and Maca. Ashwaghanda, a popular Ayurvedic herb is a powerful antioxidant that is beneficial to the cardiovascular, nervous, endocrine and immune systems. What does that mean exactly? It means that by including this herb into your diet you’ll be helping your body to decrease stress and anxiety, help with depression, fatigue, insomnia and support an underactive thyroid. It is also a powerful hormone balancer, immune booster and helps to improve your overall well-being. Maca is the other powerful adaptogen we have added to our Breakfast Blend. This root vegetable which I think tastes slightly of butterscotch, is an incredible hormone balancer, it helps to increase strength and stamina, fight fatigue, boost immunity and increase fertility. Together these two adaptogens, along with the other spices form a powerful supportive blend to help maintain overall health and well-being and ensure our bodies are equip with the tools they need to handle the everyday. Health Benefits of Turmeric and why you should be having more of it. I write this article as I sit here on this beautiful sunny morning with a heavenly bowl of overnight oats that I soaked with a teaspoon of organic Breakfast Blend, a teaspoon of organic Turmeric and a crack of organic black pepper. A typical breakfast for me, and one that I believe strongly contributes to my overall health and well-being. Turmeric, a common spice that can be found so many recipes for food and drinks and ever more so in health products like capsules and skin care. This is one spice that has grown greatly in popularity in recent years thanks to new studies and research into its medicinal and healing properties. This is just a small snap shot of the incredible benefits Turmeric has been found to help with (I’ll let you google the ones which appeal to you). With strong anti-oxidants and anti-inflammatory properties, this really is a spice you want to be adding to your daily diet. *Note: Add a little black pepper whenever you use turmeric to increase the amount of curcumin your body is able to absorb. You only need a little sprinkle of pepper but it will help a lot. Also where possible choose organic spices to ensure you’re getting maximun health benefits and no nasties. Here’s a link to our organic ground Turmeric, packaged with love in Australia. A simple and refreshing tonic full of incredible benefits for your health and well-being. This tonic is somewhat of a staple in our fridge, I usually make up a big batch and have a glass or two a day. I’ve noticed a positive impact on my health by increasing my intake of these two power house spices. Together they hold a huge variety of health benefits ranging from an anti-inflammatory powerhouse duo and packed with antioxidants to a natural tummy soother and mood booster. I top this tonic off with a squeeze of fresh lemon, some sparkling mineral water and if you’ve got a sweet tooth a touch of honey stirred through is delicious! In a large glass jar or water jug place 1 cup of hot water (just before boiling) with 1 tablespoon Turmeric and 1 tablespoon of Ginger. Stir and allow to sit for 30 minutes. Once the concoction has cooled slightly add another 4 cups of water. Place in the fridge overnight. Once the tonic has brewed overnight it is ready to drink! Simply pour yourself a glass, add a squeeze of lemon, some sparkling mineral water and some honey if you desire, sit back, relax and enjoy a delicious drink that’s doing amazing things for your body. Organic vs. Non-Organic spices - A small guide. Why buying organic spices matters. There are a couple of reasons (pretty important in my option) why you should reach for organic spices over non organic when at the supermarket. I’ve put a little information below so you can make an informed decision next time you’re needing to stock up. Firstly let’s talk about processing. Spices need to be sterilized before being sent out to be packaged. Non-Organic spices go through one of two processes. Either irradiation, where the manufacturer literally pumps radioactive particles at the spices, or fumigation, which exposes the spices to harmful carcinogenic gases. These two methods are the cheaper option when it comes to spice sterilization but I know I personally don’t want to be any of that into my body! Organic spices on the other hand go through a process of sterilization using steam. It’s the more expensive process however one that ensures the spices are sterilized in the most non-harmful way so you can get all those amazing health benefits that the spices hold! Manufactures generally don’t disclose what their sterilization methods are but basically, if you buy organic spices you’re guaranteed that the spices have been through steam sterilization. Finally you need to know about the potential for additives. Your standard spices may contain additive fillers, artificial colors, and artificial flavors. Check the ingredient list, they should say whether or not anything else has been added, but know that if you buy organic spices then you can be sure what you’re getting is the real deal. So there you have it, a brief little guide to why organic spices are the way to go. I’ve made this delicious tart so many times because it’s just always SO good and super easy. Over the past few recipes I’ve tweaked the recipe slightly to get the pastry and filling combo just right and below is the recipe. A healthy tart that will have you going back for seconds. Preheat oven to 180°C. Greese your tart tin, otherwise you could make mini individual tarts if you have smaller moulds. To make the pastry, combine flour, nutmeg, cinnamon and clove in a bowl. Use your fingertips to rub in the coconut oil. Stir in the rice malt syrup and water until a crumbly dough forms. Press this mixture evenly over the base and side of the tins. Place on a baking tray and bake for 10 mins or until light golden and dry to touch. Set aside to cool completely. While the base is in the oven spread the walnuts over a baking tray. Bake for 7-8 mins or until lightly toasted. Reduce oven to 150°C. Process the walnuts in a food processor until finely chopped. Add the rice malt syrup, cacao powder, vanilla, 2 teaspoons orange rind and salt. Process until combined. With motor running, gradually add coconut cream, then baking soda mixture until combined. Spread onto the base. Bake for 15 mins or until set. Cool slightly. Top with orange segments and a couple of walnuts and serve, but be warned, you’ll have people wanting seconds its so damn good! I’m a lover of making my own condiments and sauces so when I realised just how simple it was to make my own mustard I was so excited! With 4 ingredients and a very adaptable recipe you must try it for yourself! In a blender simple add 1/2 cup mustard seeds (grind until they are to your liking, I kept mine quite whole as I like my mustard a little more seedy), 2 tbls apple cider vinegar, 1/3 cup water and 2 tsp salt. Blend until combined, place into a jar, put it into the fridge and that’s it! So simple and so delicious, you’ll never buy mustard again! I found this heavenly citron tart from Eleanor Ozich’s website. I’ve been following her work for many years now and I must say, this recipe is one of my favourites! And what makes it even better? It all comes together in about 10 minutes! To make the crust, place all ingredients in a food processor, and pulse until the mixture begins to come together. Press the mixture in to a greased tart tin to create a tart shell. Place all filling ingredients into a blender or food processor, then blend until smooth. Pour the filling into the tart tin, and spread out evenly. Place in the freezer to set for at least two hours. To serve, remove from the freezer, and allow to soften for 10-15 minutes. A creamy curry made from scratch that’s oh so simple and tasty. Begin by placing lamb pieces and pumpkin in a large bowl. Add turmeric and salt. Mix well. Cover and rest in the fridge for 30 minutes. In a large heavy bottomed saucepan or cast iron casserole, heat ghee on high. Add cinnamon, bay leaf, coriander seeds, cardamom. Sauté for a few seconds. Add the marinated meat and pumpkin. Sauté for a few minutes, tossing occasionally until meat is sealed on the outside and starting to brown. Add the onion mixture and reduce heat to medium. Add cumin, curry powder and tomatoes. Season with salt to taste. Cover and simmer on medium for 40 minutes (or as long as you have, the longer you cook the lamb the more it will fall apart). Reduce heat to low. Add coconut milk. Cover and simmer for a further 15 minutes. Serve hot with steamed rice. A nourishing porridge that’s full of goodness! Add all ingredients and 1 cup of the liquid in a saucepan and heat until it thickens. Add more liquid until you get your desired consistency. Pour into a bowl and top with a little of whatever you feel, some things I like to add are cinnamon, buckinis, banana, berries, peanut butter, seeds… whatever you’re feeling! I do all of this to taste so have a play around with quantities of what you and your family like. Simply fry up some coriander seeds, chilli flakes and nigella seeds with the mushrooms, cherry tomatoes and garlic. While this is happening cook the Soba Noodles. Once the mushrooms and tomatoes are cooked to your liking, turn off the heat and add the cooked soba noodles, a good amount of pesto, fresh baby spinach, spring onion and bean shoots. I’m usually a peppermint tea only kinda girl, but when I went to reach for my trusty tea leaves the other evening I was faced only with an empty jar. Considering my options I decided to experiment and wow… i’ve found a new tea to tantalise my tastebuds that’s packed with so much goodness! Allow to boil then simmer for about 5 minutes or until you can smell all those gorgeous aromatic spices. A cold and flu tonic that is a lifesaver. Combine all ingredients in a pot on the stove, heat until it's just about to boil, pour into your mug, relax and enjoy. This warm, soothing tonic will feel nourishing and taste great all whilst giving your body some much needed anti-inflammatory fighting power to help you begin to feel a little better straight away. Coriander seeds, known for their digestive and immune benefits are an amazing addition to so many meals. Their sweet, slightly citrus flavour pairs beautifully with stir fries, curries and salads. Little tip: Try dry frying these little seeds to release more of their delicious flavour! Fridge? Freezer? Above the stove? In the cupboard? There are a lot of mixed opinions about how to keep and store spices. Spices flavour and quality can be influenced by moisture, light and heat. 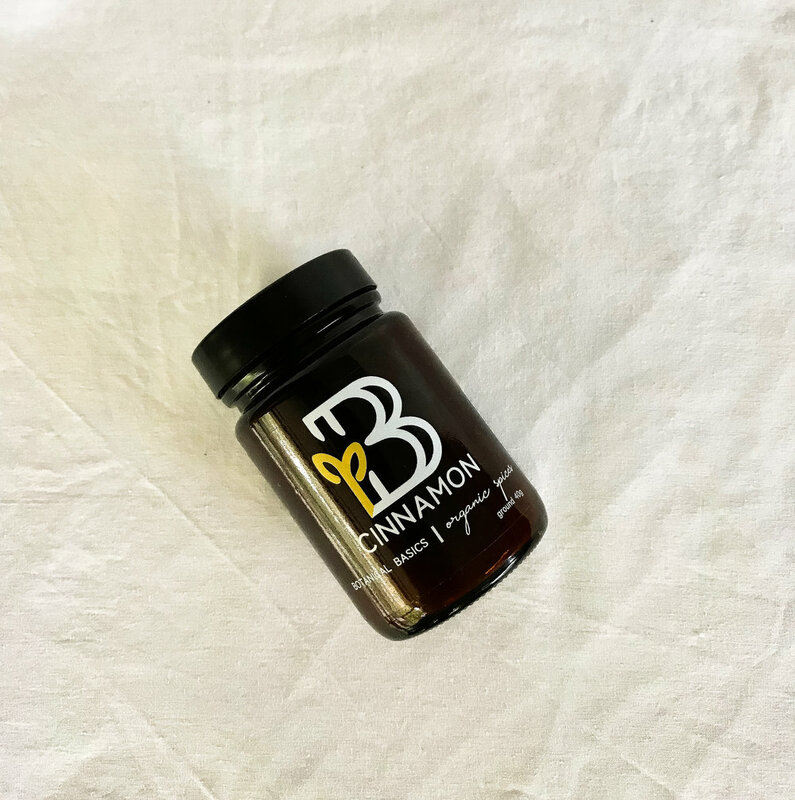 That's why BB uses high quality glass amber jars with airtight lids to ensure the spices quality is upheld by protecting them from sunlight and moisture.